Navigating around Wireway is very simple. On the main menu, "VS Mode" is labeled with the wireless symbol. The opening credits include a long cinematic, but it can be skipped. Download time is about average. The menu's touch interface is well labeled. The tappable options are large and appropriately spaced. The menu's labels are clear and easy to read, and all of the labels themselves make sense. WireWay's control scheme, the basis for its name and premise, is grabbing a wire with the stylus, pulling it back, and releasing it. Those basic elements work. Aiming and accuracy, however, are a problem. The wires can be pulled in any direction and back to about half the distance to the edge of the screen, but no further (pulling back further doesn't change anything). The game provides a dotted line indicating the expected path, but half of the time, Wiley shoots off the part of the stage the could be originally seen and ends up on an unexpected path. To complicate matters, the thicker wire type will shoot Wiley WAY beyond the screen, which would be very helpful... IF the whole stage were visible. The other major issue is the accuracy. It seems that shooting Wiley past another wire won't allow him to grab it unless he actually goes across the wire itself. Players call pull the wire over to Wiley, but often times, he's moving to fast for this to be successful. If Wiley flies past an enemy or wormhole, however, he can hit it/get sucked in without such strict restrictions. The offering of a VS Play race for WireWay works out well, seeing that there's no logical way to put two players into a standard level using cooperative play while still allowing the players to have a sense of control over Wiley. A downloadable demo is sorely missed, but the content that's there is well thought out and well executed (as well as can be; see above). Graphically, the game looks a little rough and has some jagged edges, but most (if not all) of the can be attributed to an intentional simplistic look, and not poor programming. Sound wise, the music and sound effects are nice for the mood, but are unnecessary and can be skipped/muted if so desired without any negative effects. WireWay is cute game based off a decent concept: pick and fling your character through levels by pulling strings/bands on the touch screen with the stylus. It's a concept conceived specifically for a touch screen device. With improved accuracy and more acurate aiming, the game could be really, really good. As it stands, the game is still passable, and makes its case as a clear choice for mindless fun if the aiming/accuracy issues don't wear too heavily on you. I did enjoy it and, while I do have a lot of Single-Card Download games, this one won't sit on my shelf forever, and will make itself known again. Add the ability to look around the whole stage when aiming. Allow the player to shoot further by pulling the wires back further. Correct the accuracy balance between Wiley auto-grabbing wires and hitting enemies/wormholes (see above). Include a downloadable Demo offering with a tutorial and one or two levels. 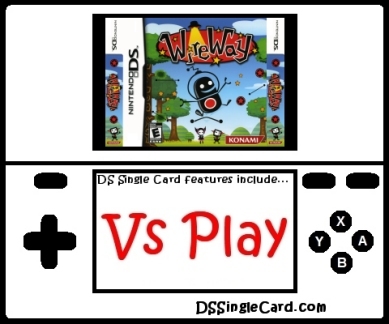 Click here to return to the DSSingleCard.com WireWay profile.